In this public talk as part of Bristol University's engagement programme Dr Mike Fraser, who has studied in both computer sciences and the social sciences, talks about the changing contexts and uses of computers as we move from mainframe only computing 25 years ago through personal computers to mobile computing today. A wide-ranging, accessible and engaging talk that considers, through Mike and his colleagues' work and the work of other researchers, context awareness, private versus public interfaces, ubiquitous computing and ambiguity. Dr. Mike Fraser is a reader in the Department of Computer Science at the University of Bristol. His research is concerned with the public and social interaction with new technology, spanning distributed, physically active, haptic, mobile and ubiquitous systems. Posted on Thu 3 June 2010. 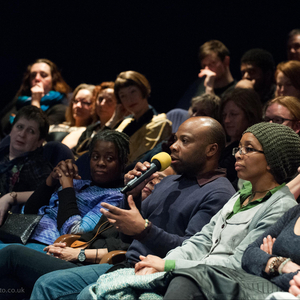 Watch and listen to talks and conversations across cultural cinema, art and technology at Watershed.